A Friday afternoon wander through the art and inspirations of Paris to London, and finally through the Yorkshire Wolds brought a number of mixed feelings – positive and negative, along with an increased weariness of the blockbuster exhibition. It was a most enjoyable visit to the new exhibition Picasso and Modern British Art, showing at Tate Britain until mid July. This experience was a reminder of how a major exhibition should be, beautifully curated and without the crazy crowds and hysteria that now seem to be the norm, (up to now of course). In fact, it was surprisingly quiet as this exhibition has only been open a few days. This tranquil and calm atmosphere allowed the viewer to quietly look and engage with each piece without been leaned on, pushed out of the way or scowled at. Being able to walk around the exhibition freely, having space to go up close to work and having time to study and analyse a painting was a most pleasant experience. This is an excellent exhibition, highlighting some of Picassos best known works and the artists influence on an early-twentieth century group of British Artists working in London. Some knew Picasso personally, while others never met but have acknowledged Picassos influence on them in some way. Some of the artists saw his work in Paris, or met Picasso when he visited and worked in London. 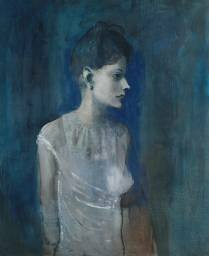 The Picasso highlights for me were Girl in a Chemise (c1905), shown below and the etching of the powerful image Weeping Woman. For my taste, I felt that the work of many of the British Artists, Duncan Grant, Ben Nicholson and Graham Sutherland in particular outshone the Picasso works placed alongside. A number of the Ben Nicholson paintings on display demonstrate a beautiful and harmonious palette and subtlety of composition which made them particularly exciting. The final room in the gallery was devoted to Picasso and Hockney and was a rather good lead onto my next visit. It was interesting to see Hockney’s early photo-montage pieces both acknowledged the influence of cubism, while leading to the Artists current preoccupation with producing large-scale paintings made up of a number of canvases placed next to each other to create a whole. The exhibition David Hockney RA: A Bigger Picture now at the Royal Academy until 9th April is one that I had been looking forward to for a long time. I have always had a great admiration and respect for David Hockney, in particular for his figure paintings and exquisite draftsmanship. This is an outstanding exhibition in which you can only admire Hockney for his vision, dedication, and huge amounts of energy in producing this enormous show. It is difficult to believe that it is only 5 or 6 years of his endeavors that fills the Academy to bursting point. But in all honesty I felt it was too much. Sometimes, less is more and this is one of those times. There is so much to absorb and the repeated theme room after room, with the very large scale work made up of many canvases became overpowering. Working on this scale with such an intensity of colour, one or two works per gallery would have been perfect, not six, eight or more. This exhibition was one of many recent shows that was totally ruined by the insane numbers of visitors to the galleries. If you thought the recent Leonardo exhibition was busy, you haven’t seen anything yet! If the paintings hadn’t been so large you wouldn’t have seen anything. It was such a frustrating experience, there were so many people that I had almost had enough in the first room. Why Royal Academy, (and fellow institutions) with your ever increasing tickets prices don’t you reduce the number of timed entries. It’s just pure greed. No-one can look at art in these circumstances. Not all of us want to wander round in five minutes flat more concerned by discussing where to go for lunch etc. 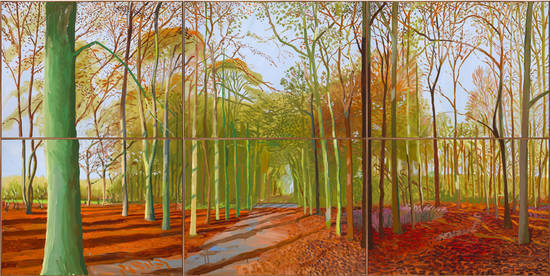 The exhibition opens with four large paintings of Thixendale Trees depicting the four seasons that were rather striking. The following gallery had a number of earlier landscapes from the 1960s and 1990s. The large A Closer Grand Canyon of 1998 was stunning in its use of pure saturated colour, oranges and vermillions so vivid they seemed to have an internal light. There were six beautiful charcoal drawings in room 6. The well documented ipad drawings were interesting food for thought, both in the large print format as well as those viewed on smaller screens. It would certainly be easier to travel to Luxor with this app rather than the usual painting paraphernalia. I do though wish that I hadn’t read Sewell’s review of the exhibition in which he said Bambi would have looked at home in these incredibly colourful landscapes. Although in one or two of them it would be more appropriate to have Grayson Perry riding through on his pink motorbike with Alan Measles aloft! Maybe the moral of this is not to try and see two blockbuster shows in one day. Lets just hope that it’s not going to be the same battle around the Freud exhibition in a couple of weeks. But alas I fear it will be impossible to analyse those brushstrokes for too long before the weight of the crowd moves in. This entry was posted in David Hockney, Drawing, Exhibition, Grayson Perry, London, Luxor, Painting, Portraiture, Uncategorized and tagged Ben Nicholson, David Hockney, drawing, graham sutherland, landscape, painting, paris to london, Picasso, Royal Academy, Tate, tate britain, working in london, yorkshire wolds. Bookmark the permalink.